My family just arrived from an island trip in Bohol when I finally received the package my cool boyfriend has sent me. Presumably, I was thinking of the books that my Craseyfish mentioned together with some little trinkets that come with the packet. 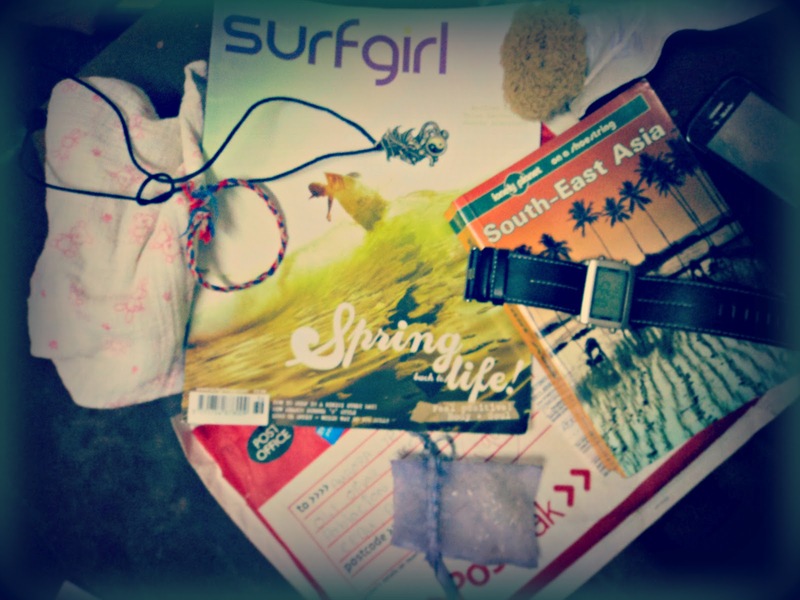 I was in awe upon seeing the SURFGIRL MAGAZINE peeking through the small space inside the big mail envelope. Oh myyyy! I didn't expect that he got me the April Issue! I have been so ecstatic checking every page of it since I so LOVE the surfing vibe, never ending muss-free beach styles and especially how the girl power in the industry continues to rise promoted in specific magazine like this. The idea of having another surf-related reading material makes me more motivated to learn more and more about surfing and its corresponding lifestyle that mirrors on my outlook in life. I also got a black strapped watch with an alarm and timer; an ethnic-inspired wristband in UK colors - Blue, Red and White; Lonely Planet SouthEast Asia Travel Book; a pair of earrings with lovely faux diamonds; a medium-sized baby towel in white and pink; and a postcard (Taunton) with those sweet messages from him. Thank you so much to my Sweetie. I so love them all.